Formula 1 teams have been forbidden from using coded messages as part of a ban on giving their drivers advice over team radio. Governing body the FIA wants to prevent "coaching" by radio, including giving advice on how to go faster in corners. Among a list of forbidden subjects sent to the teams on Monday were warnings about brake wear and fuel consumption. 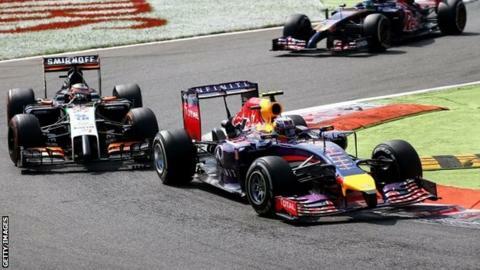 Teams are concerned the new ruling could lead to reliability problems or, in the case of brakes, safety issues. The list of banned and allowed messages - seen by BBC Sport - is two pages long and features nearly 50 items. The new approach is a response to concerns that radio messages about driving advice or managing the car were giving the impression the drivers were effectively puppets carrying out the plans of engineers in the pits. One senior engineer said: "People should be careful what they wish for - this is going to mean almost no radio traffic at all." Banned radio messages will also not be allowed to be displayed to drivers on pit boards. Teams fear it will make drivers' lives difficult in a complex sport that has fuel consumption as a central part of races. Drivers have access only to information on the amount of fuel they have used in the race and the consumption on their previous lap. So it will be all but impossible for them to work out whether they need to use less fuel to stay within the allowed limits for a race - cars are allowed to use no more than 100kg of fuel in a grand prix and consume it at a rate of no more than 100kg per hour. Teams could decide to err on the side of caution with the amount of fuel they put in a car for the start of a race, but every 1kg of extra fuel carried is punished with a time penalty of 0.1 seconds per lap - or about six seconds of total elapsed time for the average race. Preparing the cars for the start of the race will also now be much more difficult, and management of the hybrid engines will be made more complex following the decision to prevent drivers being told the state of charge (SOC) of their batteries. In some cases, this could even lead to retirement as for some cars a battery failure means the car stops working. From the race in Japan next month, teams will also not be allowed to warn drivers about brake wear or temperatures, or tyre pressures or temperatures.